If doggy gymnastics were a thing, Gage would be on the Olympic podium! He will wow you with his flexibility in a "sploot" position (picture frog legs). Sometimes he even crosses his back legs, so you better have your camera ready to capture the cuteness! This aspiring gymnast also enjoys running the agility course, where he shows off his skills doing jumps and climbing the ramp. Gage is a dedicated athlete who spends a lot of time training. In fact, he passed CLASS training, knows his basic commands, and is eager to learn more from you, as long as treats are involved! When he takes a break from the gym, he likes to cut loose by doing nose-work, playing in his kiddie pool or with the hose, hiking, and hopefully spending time with you! Gage can also be a solid team player with most other dogs. On the human side, Gage prefers the company of older kids and adults. 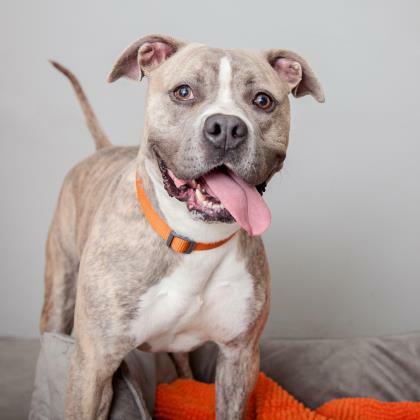 If you want to "gauge" just how awesome this boy is, come meet Gage in person. We bet you'll "flip" for him!